Databases are (mainly) optimized for data that is too large to fit in memory. how indices can help speed up queries and the various performance trade-offs in using indices in mixed workflows. We will talk briefly about disk technology, storage of data on disk and then discuss various index structures. SSD is not likely to replace magnetic disks anytime soon, but hybrid solutions will exist. From now on, we will use the term disk to refer to magnetic disks but discuss differences when we can. 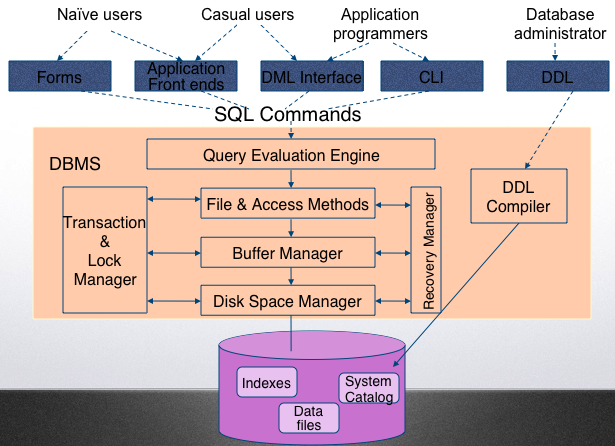 Databases are generally large data stores, much larger than available memory. Data is stored on disk, brought to memory on demand for operations. All operations are performed in memory. If necessary, after an update operation, modified pages are written back to disk to make changes permanent. A disk page or disk block is the smallest unit of access, to read and write. A disk page typically is 1K - 8K. A disk block is the same size as a memory block or page. Multiple pages on the same track/cylinder can be read with a single seek/latency. Sequential scan: access of pages on the same track (or same cylinder requiring a single seek) consecutively: single seek and rotational latency, then transfer data, very fast. Random access: In the worst case, as many seeks as the number of pages, very costly. Important messages: Depending on how data is stored, disk access times can vary greatly! 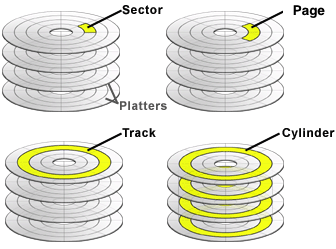 Magnetic disks can have significant different read times depending on how different data blocks are stored. On high update systems, it might be hard to store information in consecutive pages or same cylinder (fragmentation). Solid state drives do not have this type of extremely different access times. No moving parts, less power usage and no seek penalty. However, still significantly slower than memory access. Reliability of both is similar, though SSD’s are slightly worse at the moment. Speed of access and reliability of disks can be increased by simply using multiple disks. RAID: Redundant arrays of inexpensive disks is a simple theory of using multiple disks to increase both speed of access and reliability of disks. RAID can be implemented using a hardware controller or a software controller. Different levels provide different solutions at different price points. We will see only some examples. Striping of data to distribute it to multiple disks. Reads are faster as now multiple page reads can be from multiple disks in parallel. Writes are faster for the same reason. No redundancy. If one of the disks fail, the data stored in the whole array is unrecoverable. Reads are twice as fast as we can read from any disk. Writes are slowers because data must be written to both disks and the write is not complete until both writes are complete (cost of synchronization). Failure of one drive leads to no data loss because the second drive has the complete copy of data. The checksum is 1 if the number of 1’s in the given sector is odd, and 0 if the number of 1’s is even. Store each page and parity on a separate disk. The above solution requires 5 disks. Reads are faster due to potential parallel reads (same as RAID-0). Writes are slower because of the need to update the parity as well as the data disk. Note: You do not need to read all data pages at the same location, just the new data disk and parity, and update parity. Keeping all other data pages the same, we only need to flip the parity in bit locations page X has changed. Redundancy: If there is a 1-disk failure, we can still recover the lost data by reading all the remaining data including the parity. Page X of Disk 3 can be reconstructed by computing the parity of all the readable data. Reads are slower when operating with a missing disk. All data is lost in case of a second disk failure. 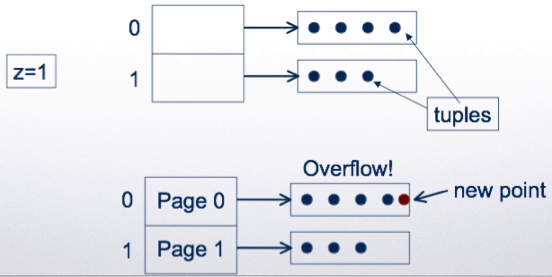 Same as RAID-4, for each page compute a parity page, but change how parity is stored. Reads are the same as RAID-4. Redundancy is the same as RAID-4. Writes are faster because the parity disk changes depending on the page being written. The parity disk does not become a bottleneck as in RAID-4. Higher levels of RAID use other parity methods, such as a 2-bit Hamming-code parity stored in 2 redundant disks. Such methods can handle up to two disk failures without loosing data with increased read performance similar to lower levels of RAID. A disk page typically stores multiple tuples. Large tuples may span multiple disk pages. The number of tuples that can fit in a page is determined by the number of attributes and the types of attributes the relation has. Header information contains LOG data: when the data on that page was updated (as well as other control information). The offset information can tell where each field in the tuple start for variable length attributes. A disk page typically stores one or more tuples. A table is a primary access method. To find a tuple in the table, we need to search the whole table. An index is a secondary access method, allowing us to search the table for a search key. The index itself is also packed into pages and stored on disk. Indices are stored on disk, not memory. Indices need to be brought to memory to be used as well. The index is called dense if it contains an entry for each tuple in the relation. An index is called sparse if it does not contain an entry for each tuple. A sparse index is possible if the addressed relation is sorted with respect to the index key. The index may be able to store more information in each page because it only stores the search key and the pointer to tuple. If we were to search for a B value, the index is not useful. To answer this query, we can search the index to find that this value is stored in tuple t4. Then, we need to read t4 to read and return the B value. Cost involves the cost of scanning the index and then reading the relevant data pages from the relation. Suppose the above table T is stored in sorted order of B explicitly. This index says that to find values less than e for B, go to page P1. Otherwise go to P2. We will not necessarily know if a B value is stored by simply looking at the index. However, the index is much smaller, making it less costly to search. We will convert the above index I1 to a multi-level index. To search this index, we start at the top level of the index (page PZ), which tells us which index page at the lower level to go to. Then, we find the necessary tuple and read the tuple from disk if necessary. Read data page P2: Find tuple t5, return the B value: f.
An index organized table is an index that also stores the data. Index organized tables in Oracle and clusters in Postgresql. This type of index is often sparse. It can be multi-level depending on the type of index. Note while we are going to use the term B-trees, the type of B-trees we will use are often referred to as B+-trees in other places. 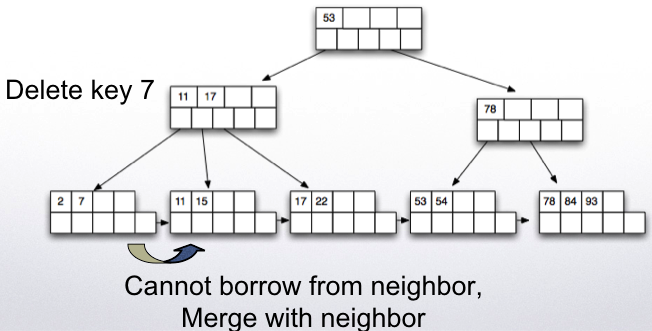 B-trees are like binary search trees, except instead of 2 (binary), they have often between n/2 to n entries. Leaf nodes point to the next node in the leaf, called a sibling node. A leaf node can contain at most n tuples (key values and pointers) and 1 additional pointer to the sibling node. A leaf node must contain at least floor((n+1)/2) tuples (plus one additional pointer to the next sibling node. An internal node can contain at most n+1 pointers and n key values. An internal node must contain at least floor((n+1)/2) pointers (and one less key value), except the root which can contain a single key value and 2 pointers. A B-tree created on a search key A will have (dense) leaf nodes sorted by A. The internal nodes will be sparse indices to the lower levels. Often B-trees are secondary structures, so we will assume so. It is possible that they are used as part of an index organized table, but we will not go into details in the discussion below. Each leaf node will have at least 2 and at most 3 tuples. Each internal node will point to at least 2 and at most 4 nodes below (and hence will have between 1 and 2 key values). Each leaf node will have at least 50 and at most 99 tuples. Each internal node will point to at least 50 and at most 100 nodes below (and hence will have between 49 and 99 key values). The root can have 2 pointers and 1 key value in the least. Notice that B-trees allow many different types of search on equality and range. However, ranges in the second attribute are not useful unless an equality in the first attribute is given. If there is no such key, then a null value is stored at this location. 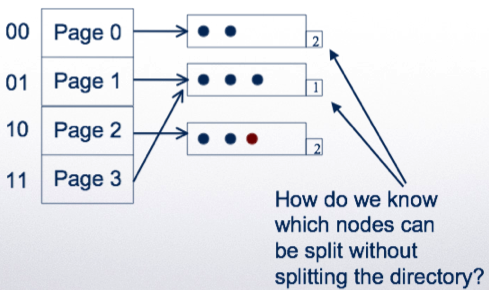 If insertion of a node that causes the node to be over full (with more than n key values for leaf or n+1 pointers for internal nodes), then split the node. There is space in the node, we are done! Finally, insert 90 which will cause the parent to split. Deletion works in reverse. If after removing a key value/pointer, the node is less than half full, then we try to borrow from a sibling. If this is not possible, then we merge with a sibling node. and update the parent node key value if necessary. Borrow and adjust key values and done. Results in deletion of the root node. 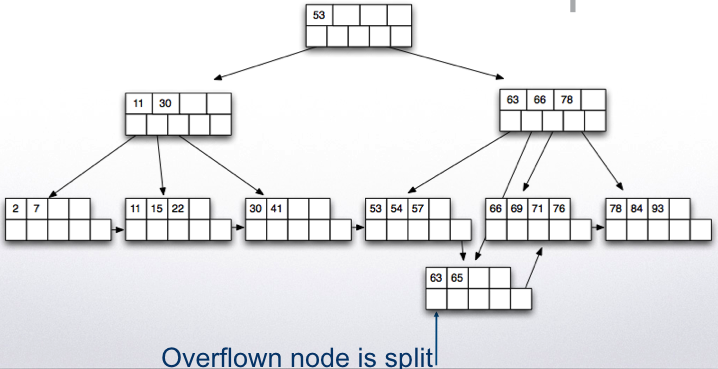 In this case, the second range is not useful in limiting the number of nodes searched. When searching for spatial data, a common query is finding all points (x,y) values in a range as the one above. To facilitate such searches (as well as other special queries like nearest neighbor searches), R-trees are introduced. An R-tree is similar to a B-tree except each key value in an internal node is a rectangle and contains a pointer to values and rectangles within that rectangle. Postgresql GIST structures allows you to implement R-trees. When indexing text valued attributes, it is necessary to first preprocess the text fields to find all words within. Then each inverted listing is compressed for storage. A Boolean keyword query is processed by bitmap operations (bitwise AND, bitwise OR) over these vectors. Postgresql GIN structures are used for this purpose and text querying. Other open source implementations of inverted files such as Apache Lucene project exist. Google main index is a distributed and replicated inverted index over the Web documents. There can only be a single primary index. Use clusters in Postgresql to generate primary indices. 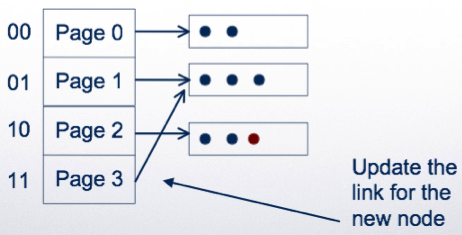 Hashing is often a primary index method. For each tuple t, apply the hash function h(t.A)=x. Store t in the blocks allocated for bucket x. 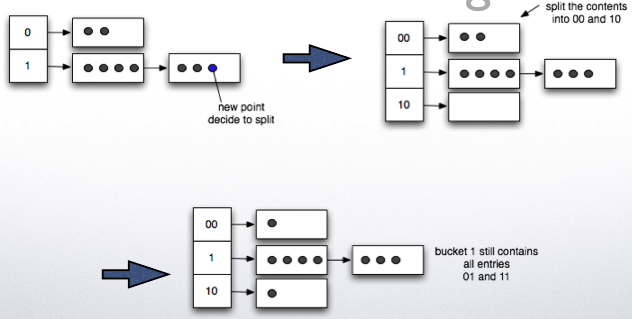 Read the buckets for y to find value c.